My 3rd blogiversary (in early November) passed before I realised it had arrived. 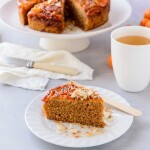 I let Thanksgiving slide by without a mention or a single pumpkin recipe. I managed to outdo myself in December — with no less than three truffle recipes, two cookies, a pie, an ice cream bombe and some spiced syrup — but the other day another milestone crept quietly past. I only remembered the day after, while sitting at lunch with a client no less, that I had arrived in Australia 12 years ago intending to stay for 6 months. My girlfriend and I landed in Sydney on 22 January, stayed in a hostel for as little time as possible, and by the 25th we’d moved into a fire-trap terrace in Pyrmont with 10 other backpackers. The following morning, Australia Day, we went to Hyde Park and while sitting on the grass listening to a band we started chatting to a girl nearby. It turned out her boyfriend went to the same university we had and moments later, as he walked up, we realised we knew him. Hello small world. We spent the rest of the day and evening with them, ending up at one point at a party overlooking the Sydney Harbour Bridge, and crashed in their spare room for the night. The next morning we suffered through a severely hungover ferry ride to arrive back at our new home and finally meet the roommates. Hello Australia. 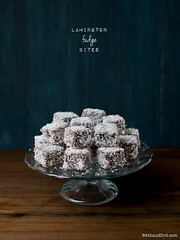 Tomorrow (or today most likely by the time you read this) is Australia Day and, while I was fully prepared to let it float by without mention, I could not stop thinking about making little tiny bites that look like Lamingtons — but aren’t. So here you go, Lamington Fudge Bites. 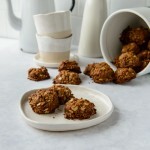 Vegan and Gluten-Free and Soy-Free and, if you use cashews instead of chickpeas, Raw. Sacrilege? Possibly. But when has that ever stopped me? 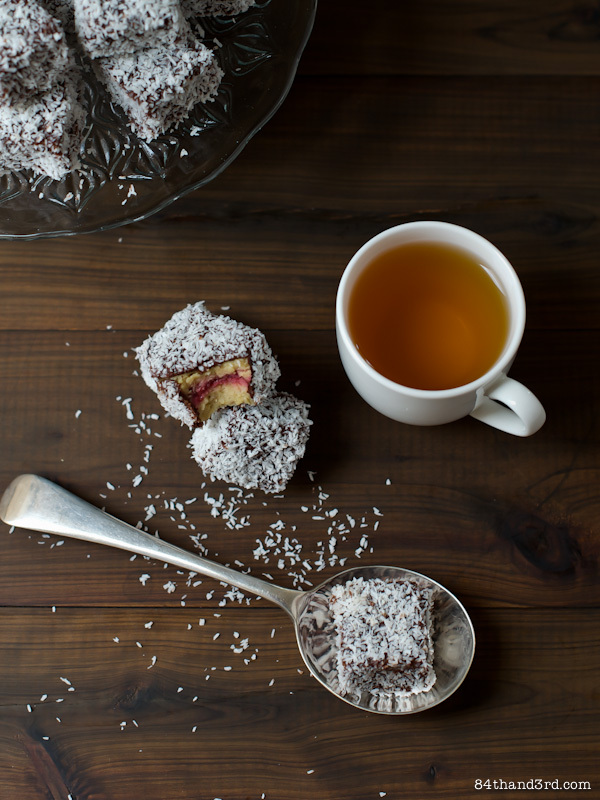 If you want a (slightly) more traditional twist, last year I made Lamington Cupcakes. 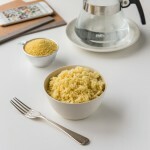 Of course if you just want an Aussie inspired recipe I’ve got those too. Have a lovely Australia Day if you are in Australia, and a lovely January 26th if you aren’t. 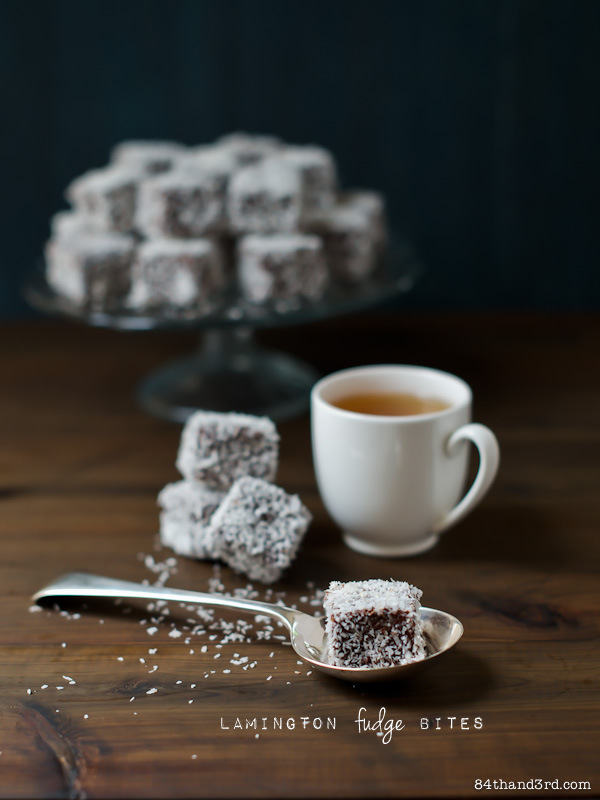 You’ll find me eating these Lamington Bites with my Australian husband, a fair bit more sober than 12 years ago. And while I wish my girlfriend was on this side of the world to celebrate with me I’m certainly glad I don’t live in a house with 11 other backpackers. It’s all about perspective – ha! 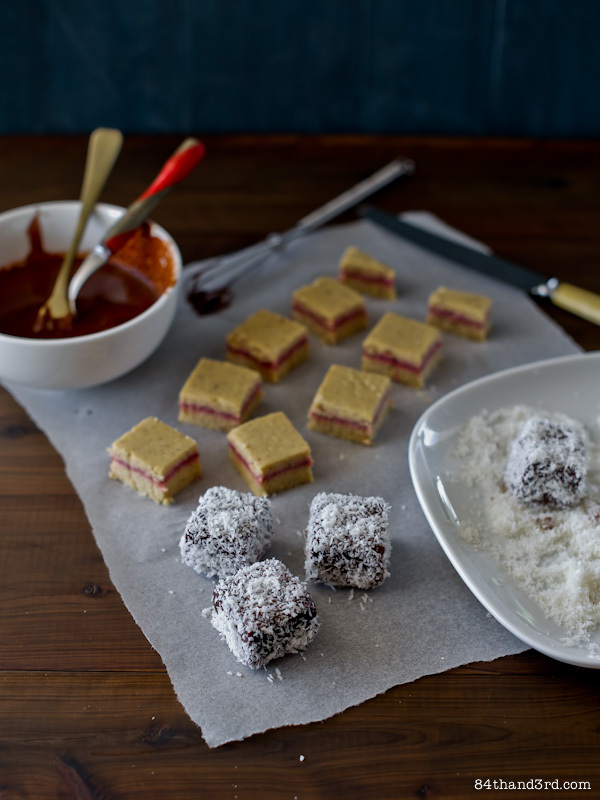 Little tiny Lamington Bites filled with a just-sweet vanilla fudge and a tangy raspberry jam. Go ahead, have another. Submerge dates in boiling water, cover and allow to cool 10 mins. Blend chickpeas in a processor until crumbly (or cashews to a paste). Add dates, including soaking liquid, vanilla and coconut oil. Blend until very smooth and creamy. Add salt and lemon juice and blend to combine. Using an off-set spatula, spread half the fudge mixture into a 15 cm (6 inch) square on a piece of baking paper, refrigerate for at least an hour until firm. Meanwhile, simmer raspberries with a small splash of water until thick, about 5 mins, mashing lightly with a fork. Allow to cool. Spread all the raspberry filling over the base and refrigerate 20 mins. Dollop remaining fudge mixture on top of jam layer and gently spread evenly to cover. Refrigerate at least 1 hour or overnight until firm. Trim edges then slice into 5 strips, cut each strip into 5 squares. Combine cocoa powder and coconut oil in a small, deep bowl and stir until smooth. Spread coconut on a plate or shallow bowl. Place a fudge square on a small fork. Dunk quickly into chocolate, spooning more over sides if necessary, and tap to remove excess. 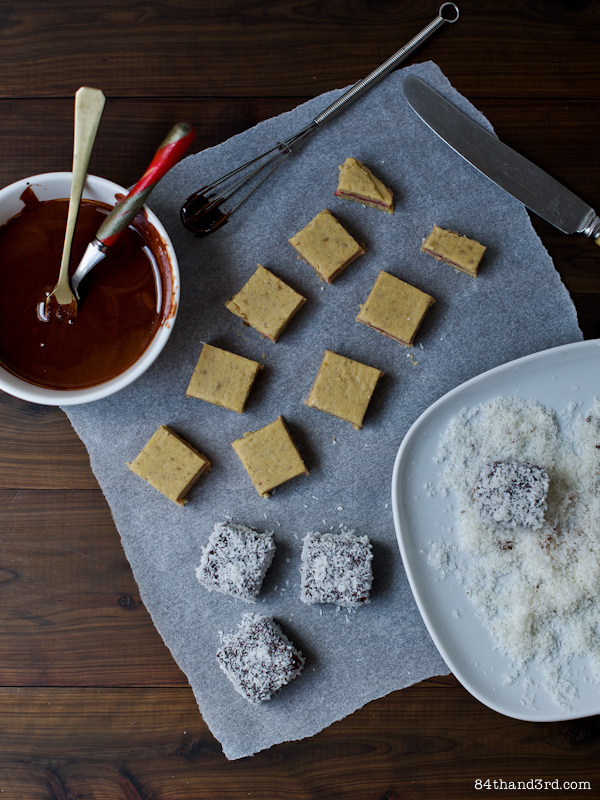 Immediately push coated square into coconut and coat before chocolate sets. Set on baking paper and repeat with remaining squares. Store in refrigerator. If you wish, add a touch of rice syrup or honey to the chocolate coating. These look and sound amazing JJ!! Yum. What an interesting idea. These look fantastic. And such an interesting way to use legumes too. 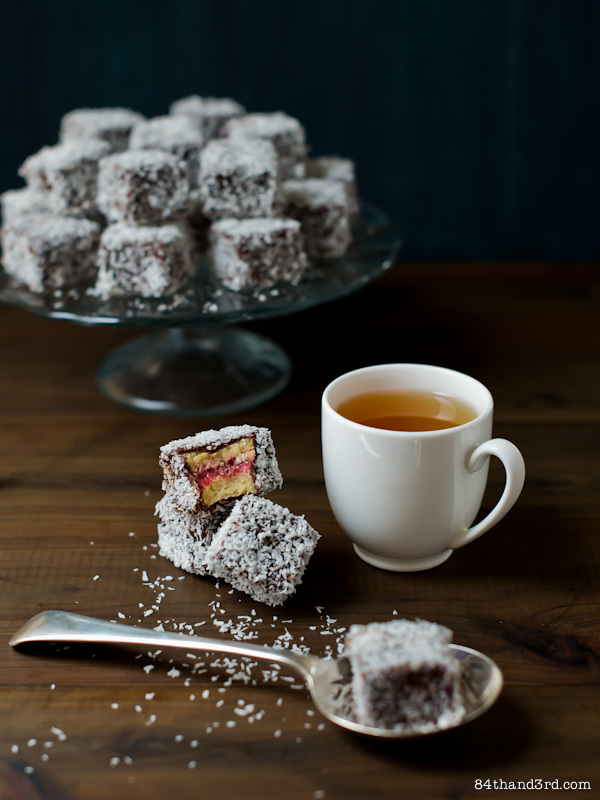 These look great JJ, I do love a lamington of any variety really! 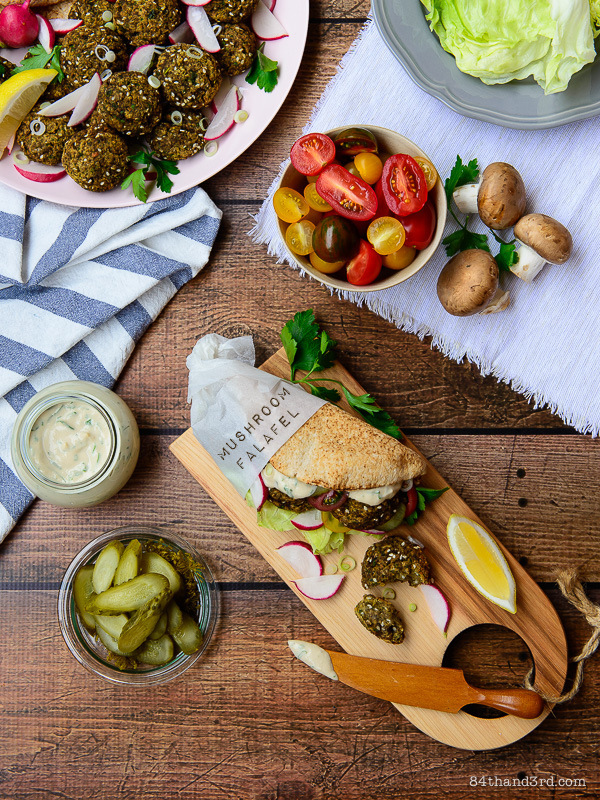 What a great use of chickpeas. Love it. These look fantastic JJ. Happy 3rd JJ… your little bites look very tasty! What an interesting recipe. Would of never thought it had chickpeas in it. Must try it. These are super cute. What a great idea!! Loved your story. I had forgotten the details. Sure wish I had some of those right now! Ha this would totally mess with people’s heads! JJ these look just as good as the real thing if not better. I’m glad that you decided to stay. We must have our blogoversaries very close together. My 3rd was the 14th of November last year. These look amazing! I also tend to let holidays pass by without a nod. Congrats on your 12 year anniversary. Made these today!! They were amazing! Thanks for the recipe!